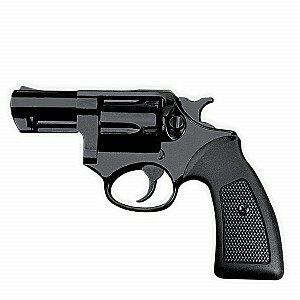 Revolver detonante Chiappa modelo Competitive 380 de acción manual y disparo frontal. Posee una longitud de 180 mm. y su peso total es de 660 grs. Utiliza munición detonante del calibre 380 9 mm. y tiene capacidad para 5 disparos. Chiappa blank detonating revolver model Competitive 380 with manual action and front firing. It features a 180 mm. length and has an overall weight of 660 grs. It uses 380 9 mm. blank detonating bullets and has a capacity for 5 shots.